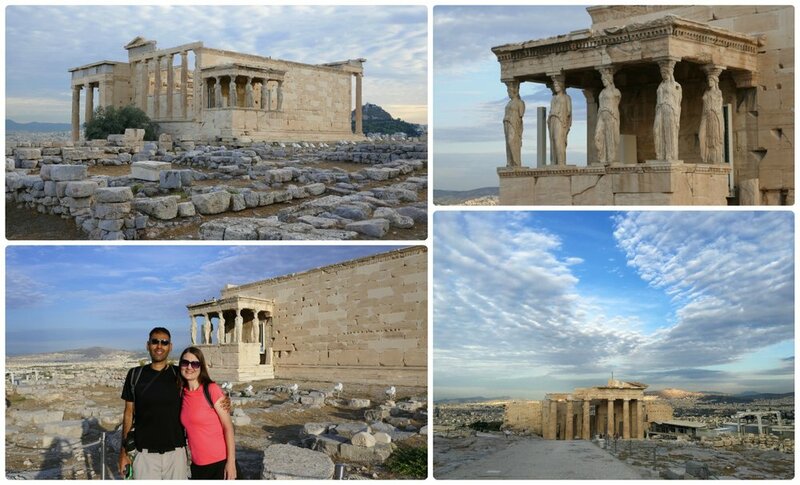 When in Athens, Greece, a visit to the Acropolis of Athens is a must on just about anyone's sightseeing itinerary! It's the biggest tourist attraction in the city (and country! ), which is no surprise, since this 2,500 year old site towers over Athens from its location on the rock formation in the middle of the city. There are many vantage points to admire the Acropolis of Athens, from the bottom of the 150 meter (492 foot) hill it stands on or from one of the many outlooks in the city (Monument of Philopappos on Pnyx Hill or Mount Lycabettus). However, there’s nothing like seeing it up-close, and if you’re like us, you're going to want to see it with as few people around as possible. 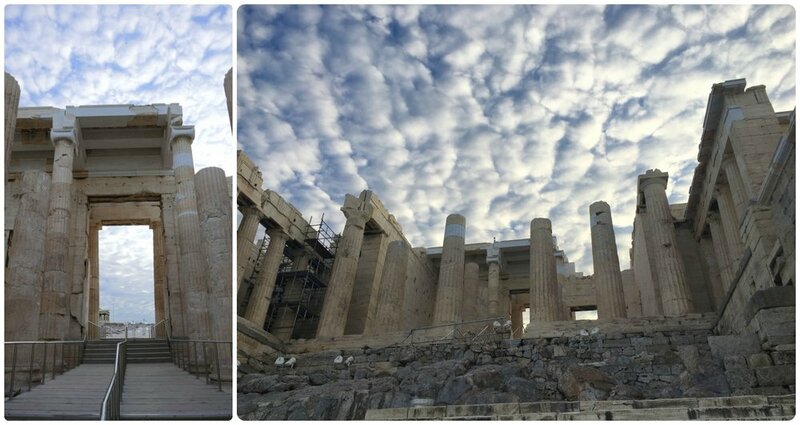 So, read on for our tips and tricks on how we accomplished this seemingly impossible task: Having the Acropolis of Athens to ourselves! To put it into perspective, we visited the Acropolis of Athens during the shoulder season (in late September), so in theory crowds should have been thinner, as we’ve heard the summers in Athens can be packed with tourists, especially from cruises. The day before visiting the Acropolis, we did a short hike up Pnyx Hill to see the Monument of Philopappos and got a few good photos of the Acropolis of Athens from the view point. From where we were, we could see that the site (at around 12 noon), was absolutely packed with people, and while we don’t have an official count, it looked like hundreds if not thousands of people were walking about the Acropolis of Athens. The following morning, seeing as how the Acropolis opened at 8 am, we arrived about 20 minutes before opening. True to expectations, by 7:50 am there was a line in front of the ticket office that easily surpassed 75 people, and by 8:30 am, the Acropolis of Athens was crawling with tourists. Pynx Hill over looks the city and the Acropolis of Athens. By 12-noon we couldn't help notice the crowds touring the Acropolis of Athens! We purchased our Acropolis of Athens tickets in advance, at a ticket office that didn’t have a queue (at Aristotle's Lyceum). We purchased the Athens Combined Ticket, which is an official ticket for entrance to all seven archaeological sites in Athens, Greece (including the Acropolis of Athens) that are managed by the Greek Ministry of Culture. The ticket is valid for five full days, meaning it can be purchased in advance, thus making our sightseeing and planning much easier! TIP: Keep in mind that the day you buy the ticket counts as the first day of the five it’s valid for. The Athens Combined Ticket is sold by the Greek Ministry of Culture and grants access to seven popular ancient ruin sites in Athens, Greece. We avoided a wait time in line at the Acropolis of Athens by purchasing our tickets at Aristotle's Lyceum. We’ve now traveled to over 20 countries in the last 10 months, so we’ve started to notice a few patterns. Take them with a grain of salt, since we don’t have any quantifiable evidence to back them up and it’s just our own experience. Thursdays are typically the busiest days of the week for visiting attractions, and Wednesdays seem to be the slowest. Although, Sunday mornings are usually very quiet (unless visiting churches), and Mondays aren’t too bad either. Our plan was to visit the Acropolis of Athens on Sunday morning, but we forgot to pack the tickets in our daypacks (Shannon here! Completely my fault… oops, Monday it had to be!). Instead, we ventured out the next day, on Monday to see the Acropolis. Tip: Google has a cool tool within Google Maps that shows you an estimation of how busy a particular attraction/location is. To view it, look up the 'business’ in Google Maps and click on the business entry to see more information. Along with contact information, hours of operation, and reviews of the business, many businesses will have a graph of ‘Popular Times’. It can be difficult to wake up so early, but arriving at an attraction before it opens will get you a place at the front of the line. The Acropolis of Athens opens at 8 am year-round (it closes at 8 pm in the summer and 5 pm in the winter). We arrived at 7:40 am, and while there were already a handful of people waiting in front of the ticket office, we were able to go directly to the front of the entrance line since we already had our tickets! Tip: Arriving early also works for popular attractions that are ‘always open’, like monuments and parks. Since you can't arrive before it opens, it’s a matter of arriving earlier than everyone else. We’ve been known to leave before sunrise to get a good picture of a popular attraction. We visited the Acropolis of Athens first thing in the morning to avoid the crowds. We arrived before opening and were fortunate to be the first in line to enter (since we already had tickets - see step #1). Result: The Acropolis of Athens to Ourselves! There was only one other person in the entrance line with us, even though the queue for buying tickets had grown close to 100 people! We were the first to enter the site and because we’re both fit and able bodied, we were able to climb the stairs to the top quickly (with caution of course!). On the way to the top we snapped several pictures and by the time we reached the top and walked up to the Parthenon, we had the area (other than the employees), to ourselves! It may have only been five minutes, but those five minutes sure were sweet! We took pictures that captured the calmness of the site, that only a few minutes later would’ve been impossible. We had an amazing backdrop for pictures too; the sun was rising, the sky was beautiful, and no one else had climbed to the top yet. It took about a full 20 minutes for the area to started to feel crowded, and about 30-35 before it was too crowded for our liking. Don't forget to take in the sights as you walk your way up the dirt path to the top of the Acropolis of Athens. We may have paced ourselves ahead of the crowd, but we still took the time to take pictures! You'll make the final ascent through the entrance gates of the Propylaea before reaching the top of the Acropolis of Athens. Just 30 minutes after these pictures were taken, the area was a sea of visitors. 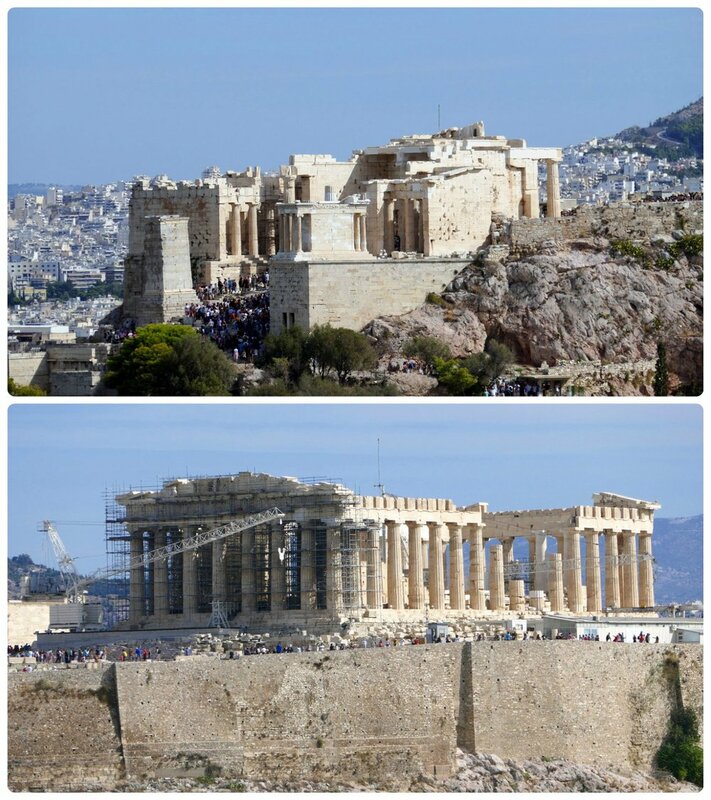 Clockwise (from the top): The foundation and ruins of the Temple of Athena with the Erechtheion and Pandroseion in the background, the Porch of the Maidens, looking back the Propylaea from the top of the Acropolis of Athens, us in front of the Erechtheion and Temple of Athena. It's an amazing experience to be at the top of the Acropolis of Athens and see the Parthenon, but seeing it in the calm of the morning is indescribable! Clockwise (from the top left): Inside the Propylaea, us in front of the Erechtheion, the side of the Erechtheion, the Temple of Athena Nike. Top: The view overlooking the city of Athens from the top of the Acropolis of Athens. Bottom: Looking up at the Porch of Maidens from the lower pathway on the West Slope. To those that think we rushed up and missed some of the experience, we’d have to agree that we did, but we gained it on the way back down. We made sure to stop and appreciate the sights and the history as we worked our way down the hill. So over all, we feel we had a tremendous, fulfilling, and once in a lifetime experience! Clockwise (from the top left): The Temple of Asclepius, East Slope of the Acropolis, Theatre of Dionysus Eleuthereus, the crowds about 30 minutes after opening. We thought that getting tickets ahead of time and arriving early at the Acropolis of Athens would allow us to enjoy it with less people. However, we didn’t know we’d be treated to the ceremonial raising of the flag by the Greek military. At 10 minutes before 8 am, seven men stood at attention at the entrance of the Acropolis of Athens. They faced us directly, while those who were waiting in line to buy tickets could only see the ceremony from the back because of where the ticket line was located. The men marched under command to the top of the Acropolis, with the man in front holding the Greek flag, and the rest holding rifles. We lost sight of them while we waited for the gates to open, but we made it to the top in time to see them hoist the flag up the pole and sing the Greek National Anthem. It was a bonus to our experience that we won’t soon forget! While most people were still waiting in line to purchase entrance tickets, we were able to see the ceremonial rising of the Greek flag atop the Acropolis of Athens.